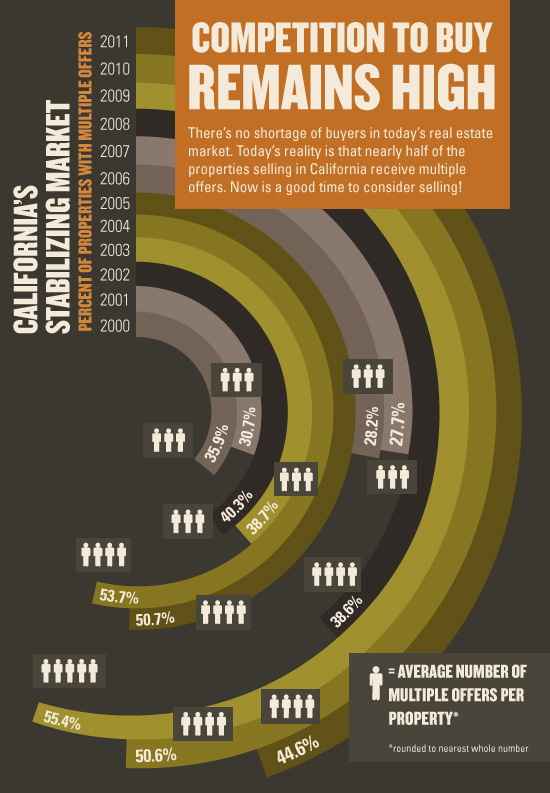 As you can see from this interesting 11 year chart provided by the CA Association of Realtors, we are back in a “multiple offer” market again on a state level. This has also happened to the market here in Kingsburg. In addition to receiving multiple offers, we are also experiencing “over asking price” offers on some properties. This seems to apply mostly to homes that are in great condition, in a good location and priced right. As I have been stating for the past 9 months or so, the market here has been changing and changing for the good. Inventory is still way down, especially in the “affordability” arena. Most of the recent new listings have been in the upper end price range and even though the average price per square foot (PSF) for Kingsburg overall is at $118 PSF, these upper end homes are selling in the $135 to $150 PSF price range. Bottom line …… NOW IS THE TIME TO BUY! Interest rates are at 60 year lows and inventory continues to decline! If you were not able to attend the first Kingsburg Farmer’s Market held in downtown on May 17th, you missed a great event. Check out their awesome website at G J Gardner Kingsburg Farmers Market Facebook to view the upcoming Thursday night markets and all the cool things that are happening each week through October 6th. And don’t forget the Concerts in the Park starting on Thursday, June 21st and continuing weekly until July 26th. If you can, make a point of attending the July 12th event as we are sponsors for the evening and would love to see you all there. Please feel free to call us if you have any questions regarding the real estate market or lending. We are here to help!